During the past decade, persistent excess productive capacity, at levels exceeding at times 25 percent, has blighted the British economy, along with rates of unemployment not experienced for two decades, with the result that a substantial proportion of the economy's productive resources remain underutilized. Orthodox economic theory often ascribes such phenomena to a lack of capital for investment. However, in the same period, interest rates have been historically low, and the UK corporate sector has accumulated increasing reserves of surplus capital. Clearly, there has been no shortage of capital for investment. 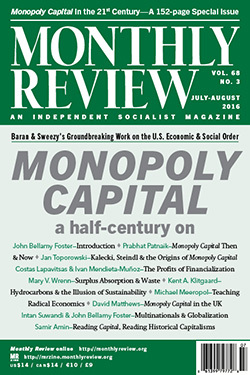 The failure to invest stems not from the supply of capital, but instead from the paucity of investment opportunities, suggesting that British capitalism is mired in stagnation.